Nokia refresh our offer mobile music with three new models - 5030 XpressRadio, 5330 XpressMusic and 5730 XpressMusic. The cheapest of them, model 5030 XpressRadio, is a classic candybar shape with weight of 83 grams. Screen is a 1.8-inch with a resolution of 120 x 160 pixels, and an antenna for the FM radio built-in within the mobile, so that the headphones (which are normally used as an antenna) may not be connected. Interestingly, model no camera, and built the direct buttons to control when listening to the radio. Will be available in red and graphite colors at a price of 40 euros during the second quarter. Model 5330 XpressMusic is a 3G slider with a 2.4-inch screen resolution of 240 x 320 pixels. Built-in camera resolution of 3.15 mega pixels, GPS module, 70 MB of memory and slot for microSD (HC) memory cards. Mobile will be on the European market appear during the third quarter, according to recommended sale price of 160 euros. Best-equipped model is the 5730 XpressMusic. 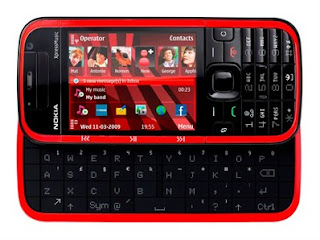 A distinctive feature of mobile phones is a QWERTY keyboard on the drawing is built in 2.4-inch screen, the camera of 3.15 mega pixels with Carl Zeiss optics, 100 MB memory and microSD slot. GPS, FM radio, Wi-Fi and Bluetooth are also present, a mobile phone will be sold in Europe since the third quarter at a price of 280 euros.